With solo travel on the rise, going it alone often means you can really unwind and get the best experience from a wellness break. From yoga and detox retreats to rejuvenating spas and wellness clinics, we’ve travelled solo to some of the best wellness spots around the globe. Here’s our pick of six retreats where you won’t feel lonesome on your ownsome. Overview: Perched on a beautiful mountainside overlooking the Mediterranean Sea and part of the Sierra Helada Natural Park, (recognised by the World Health Organisation as having one of the world’s best climates) this state of the art luxury wellbeing retreat combines western medical expertise with proven, eastern alternative therapies. Everything from Chinese medicine and Thai massage to cosmetic dentistry and stem cell therapy is on offer here and dotted around the clinic are anti-ageing, Energy Health and Regenerative Medicine units. The wellness area offers a plethora of facials and a whole range of massages, body treatments and water therapies. 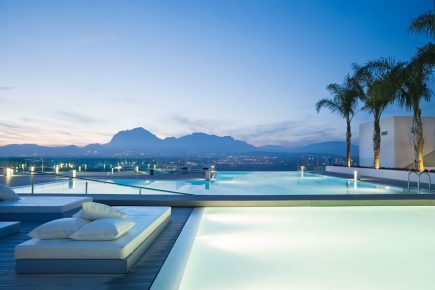 If you fancy a dip there’s a stunning outdoor rooftop pool and the wellness area boasts a complete hydrotherapy circuit with two indoor pools. Rooftop relaxation areas with day beds, means you can take in the spectacular views or hunker down with a novel. Programmes on offer include SHA Discovery, SHA Fitness, Sleep Well, Rejuvenation, SHA Detox and SHA Cosmetics Programmes. To Stay: 93 suites span five crisp white buildings, Cool, airy and stylish, all boast large terraces and are equipped with the latest technology. Features include à la carte music, pillow menus and bathrooms with comfort lighting. To Eat: Based on the Macrobiotic Diet, cuisine is served in the SHAmadi restaurant. Three types of diet are adapted to the seasons, making an effort to use cereals, legumes, vegetables, fish and cooking methods that are best suited to each season. None of the menus include meat, eggs, dairy products, sugar or other artificial sweeteners. It’s a very laid back eatery with a friendly atmosphere, so dining here alone doesn’t feel uncomfortable. Going Solo: SHA is one of the best wellness clinics in the world so lots of people opt to come here alone and take full advantage of all its offerings. From morning yoga and organised group walks to fitness classes and wellness seminars there’s a plethora of things to fill your days and evenings. 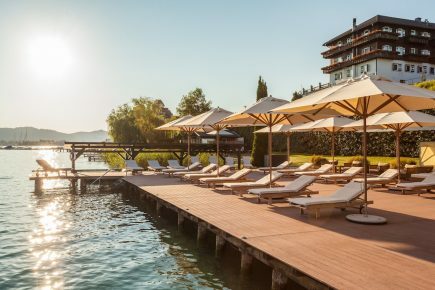 Overview: Set on the southern shores of Lake Wörthersee, in the midst of verdant hills, The Original FX Mayr is a place of purification, detoxification and renewal – a tranquil atmosphere in which you can really breathe. Physicians and therapists develop detox programmes specifically designed for you. An individual, holistic concept comprised of nutrition, movement and treatments at the highest level. In addition to the classic FX Mayr cure, various coordinated key treatments are tailored to your current needs. Doctors and therapists develop a personally tailored approach using nutrition, exercise and therapy according to the latest findings. To Stay: Rooms are stylish and comfortable and combine modern facilities with the cosy charm of the historic, timber-frame building. Some rooms have balconies dressed with pretty cherry geraniums. To Eat: The principal of the cure is based upon achieving a well-functioning digestive system by eating slowly and consciously – chewing each morsel up to 30 times. Based on the Alkaline Diet food is delicious but sparse… Fresh herbal teas are available to assist with all maladies from relaxation to detoxing and there’s an abundance of bottled water to flush away those unwanted toxins. Going Solo: Most people choose to experience the Mayr Cure alone. It’s an intense detox and lethargy can kick in pretty quickly, so early nights with a book is the norm. Days are filled with yoga, dips in the lake, health check ups, detox baths and lymphatic massages. Dining alone is encouraged (so you can concentrate on chewing your food!) but you’ll make friends with fellow guests discussing the cure over copious cups of herbal tea. Overview: The BodyHoliday sits on the north west tip of St Lucia tucked in a beautiful secluded white sandy bay, surrounded by 42 acres of tropical gardens. With wellness at the heart of its proposition – daily treatments, classes, activities and watersports are included in the basic package – it’s one of the top spa and fitness destinations in the Caribbean. If you’re looking for a ‘chic retreat’ then The Body Holiday may not be for you – don’t expect private pool suites and Carrera Marble bathrooms laden with Bulgari products – it’s a well-executed, laid back luxury wellness destination that embraces its Caribbean culture. 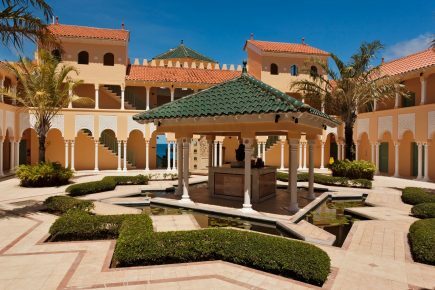 Towering over the bay, the vast Moorish-style Wellness Centre is the hub of the resort. A multitude of treatments rooms surround the cool atrium pool along with a tranquil Ayurvedic centre, where holistic offerings include Chakra Cleansing, Spiritual Eye Gazing and Meridian Healing. Daily included treatments range from Elemis facials to holistic massages and scrubs. The thing that really stands out about The Body Holiday (and lures back its 40% returners) is its magical ambience. Everywhere you look you’re either wowed by a view or greeted with a smile. Not only do you leave feeling completely rejuvenated – you’ll likely have made some new friends along the way. To Stay: There’s a generous offering of single rooms for the resort’s high number of solo guests. Traditional in style, all rooms have included mini-bars, a generous selection of Ren products, iPod dock, free wi-fi, pillow menus and – to ensure complete relaxation and escapism – zero TVs. Going Solo: The Bodyholiday has been attracting solo travellers for years – they even have a dedicated a month – ‘September Solos’! There are hosted dining tables each night for solo guests to mingle and staff interact with guests day and night. The atmosphere is so friendly that it’s virtually impossible to feel lonely! Overview: Perched in an idyllic location on the banks of Lake Geneva, surrounded by 10 acres of park and woodland, La Réserve feels a million miles away from the nearby city. The resort-style hotel evokes, as its name suggests, an African game lodge. Leopard print carpets, rare butterfly displays, elephant sculptures and fake exotic birds dress the opulent entrance while cosy bars, landscaped gardens, chic restaurants and a swimming pool create the hub. Set away from the hub, the Nescens Spa spans 20,000 square feet. Elegantly styled in crisp whites dotted with splashes of colour and hypnotic (jellyfish!) lamps, the spa is deliciously fragranced with aromatherapy candles creating a complete haven of tranquillity. Services are provided by a multi-disciplinary team of therapists, coaches and medical specialists with expertise in the realms of preventive and anti-ageing medicine, as well as aesthetic medicine. Facilities include an indoor pool, his and hers steam and sauna, a manicure and pedicure station and the wonderful healthy eaterie Café Lauren. There’s also state of the art gym, complete with personal trainers, offering a full range of cardio and weight machines as well a Kinesis room. Group classes on offer include yoga, pilates and Zumba. To Stay: The 29 suites and 73 rooms of La Réserve Genève interpret the refined style of African lodges. All are generously sized and feature wide picture windows, and some lead onto a patio giving direct access to the grounds and the swimming pool. Features include a choice of pillows, cotton sateen bed linen and black granite-tiled bathrooms. To Eat: The spa restaurant, Café Lauren serves up a calorie controlled carb free, sugar free and low salt menu, but the chef Natalie somehow make it taste delicious! In the summer months there’s a lovely terrace where you can dine alfresco. Four other high-end eateries dot the resort or you can choose to dine in your room. Going Solo: Whilst the hub of the resort is buzzing with businessmen and well-heeled families, Nescens spa is super solo-friendly. 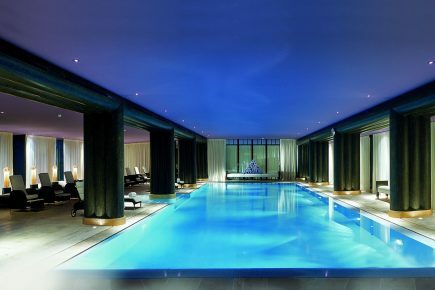 On the Nescens Better Ageing Programme you’ll take breakfast and dinner at the spa and chat with other solo spa guests. Staff are super-friendly throughout the resort and will make you feel truly welcome. If you fancy a shopping jaunt you can hop on the resort boat which takes you across the lake to the city. Overview: The multi-award winning destination spa resort is situated at the Himalayan foothills with breathtaking views and is renowned as one of the best Ayurvedic retreats in Asia. Located on a 100 acre Maharaja’s Palace Estate, the resort is surrounded by Sal forests and overlooks the spiritual town of Rishikesh and the Ganges river valley. One of the best-loved luxury ayurvedic retreats in Asia, Ananda integrates traditional Ayurveda, Yoga and Vedanta with international wellness experiences, fitness and healthy organic cuisine to restore balance and harmonize energy. The personalized therapy and activities programmes are designed to meet individual needs and health goals. A team of qualified nutritionists, western & Ayurvedic physicians, spa therapists, Yoga and Fitness experts all gently guide you towards a better lifestyle. Programmes include Stress Management, Ayurvedic Rejuvenation, Yogic Detox and Weight Management. To Stay: 70 spacious rooms overlook the Maharaja’s Palace & Hills or Ganges Valley. Rooms are traditional in style, with all the modern comforts you’ll need. There are also 4 suites with private gardens, the historical Viceregal Suite (Prince Charles and Camilla stayed here!) and 3 Luxury Villas with private pools. To Eat: Bespoke menus are designed during a consultation with the in-house Ayurvedic doctor, to align the specific imbalances of the various body types. Ayurvedic cuisine is served in the main restaurant and consists of fresh organic foods (low in fat and calories) with an emphasis on whole grains, fresh fruits and vegetables, lean proteins, low-fat dairy products and no added salts or artificial colours, flavours, or preservatives. Going Solo: For some travelling to India alone may sound like a daunting experience. Ananda staff collect you from the airport and go above and beyond to make you feel welcome. Solo travellers are the norm at the Ananda and you’ll make friends at the group yoga classes and guided hikes in no time. If you wish to venture in to nearby Rishikesh staff will take you and act as a guide throughout your visit. Overview: Set in magical surroundings amongst ancient granite boulders and a spiritual Buddhist monk cave, Kamalaya is one of the most-loved retreats in Thailand and offers a life-enriching healthy holiday. Wellness programs offer solutions for detox, stress and burnout, healthy lifestyles and yoga. If you are looking for a more personalised wellness experience, a team of international naturopaths can work with you to create your own health program from an extensive range of holistic medicine, spa and healing therapies. 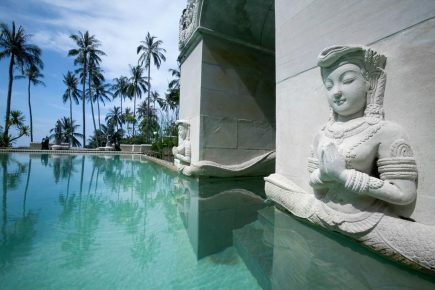 The spa at Kamalaya is set amongst an abundance of nature. Treatment rooms overlook the beach and the therapists and specialists offer everything from stress management to Reiki – each therapist carefully handpicked for their skills. Facilities include lap and plunge pools, infrared saunas, foot massage stations and Ayurvedic treatment rooms. To Stay: Hillside Rooms are luxurious retreats simply designed and accented with natural furnishings. Nestled amidst magnificent boulders and trees, the rooms are minutes away from the hilltop Yoga Pavilion and Yantra Hall. To Eat: The food at Kamalaya is a strong reminder that healthy food can be delicious. You can choose between organic cuisine that excludes the usual suspects of dairy, meat, fish, poultry, egg or the detox menu. Meals can be served in the restaurant, in your room or on the beach. Going Solo: Kamalya welcomes many solo guests year-round from around the globe. Signing up to one of their dedicated programmes means you’ll be chatting to fellow guests in no time. If you feel like being sociable you can join one of the group tables in the restaurant. If you want peace and quiet you’ll find numerous spots for sun and solitude around the resort.